Description: It's near dusk as #7642 heads north through East Chicago on the Kankakee Line. Description: North- and southbound NS mixed freights meet on the Kankakee Line at Grasselli Junction. Description: 119 rounds the curve at Avon in Gastonia. Description: UP 4011 leads NS 119 onto track one at South Fork. Description: Behind the VFW, 0853 hours. Description: NS ES40DC 7642 leading a D9-40CW with an eastbound stack train. Description: A side view of ES40DC 7642. Description: NS 721 tied down in the yard at Bristol. Description: NS 721 waits for a crew on track 7 of the Bristol Yard. Description: NS 721 idles in the snowy Bristol Yard. Description: Duke power coal train for Spencer's Buck Steam plant waits on train traffic before going to the Power plant to off load. Description: Amtrak 74 the Piedmont meet NS train 76K/PL97 at Linwood, NC near CP Duke. Description: Pan Am train MOAY arriving at Ayer, heading east through CPF-AY and back down the east leg of the wye into the hill yard. Description: 22K heads east under the signal bridge at AUTO-403. 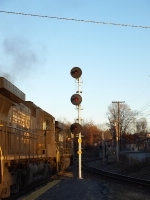 These signals were replaced in 2013. Description: GE's face to face. Description: Fall colors are about the only brightness on a cloudy and cold morning on the NS north of Columbus.